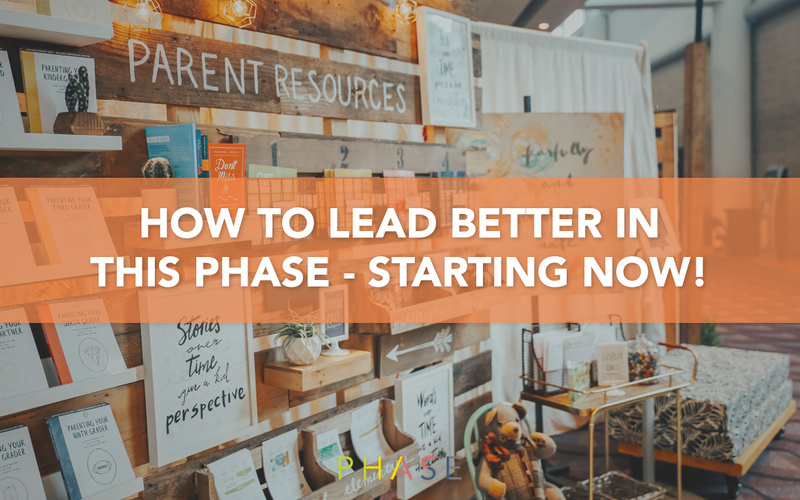 UMYF.net Online Services > Youth Minister Information > How to Lead Better in This Phase—Starting Now! Whether it simply lurks at the back of your mind during infrequent moments of insecurity or it keeps you up at night, you probably worry at times that you don’t measure up as a leader. You see social media posts from peers and experts that are “killing it,” and you silently wonder when (or if) you’ll ever reach that level of success. You’re also reminded daily that people count on you. You want to lead better, do better, and be better for them, and for yourself. You know that time is passing quickly, and the children, teens, volunteers, or staff that you lead are looking to you for answers. But sometimes the words or knowledge fail you. And sometimes it’s all just a bit overwhelming, isn’t it? You want to appreciate the people around you today, because they’ll transition or graduate to the next phase of life soon. But how do you invest in them, and yourself, without shirking your other responsibilities? These are common struggles for all leaders, and though there are no easy answers, solutions may be closer than you think. Here are three ideas to help you sharpen your leadership skills, beginning right now. Experts become experts because they kept learning. And the people you follow and hold in high regard should still be information seekers, even if they’ve achieved some measure of success. The truth is, despite what you may have said behind someone’s back, a “know it all” doesn’t really exist. This also includes learning from failures, not just through books, podcasts, and conferences. That #epicfail you had last week serves as a perspective for the week ahead. Great leaders are learners. So, grab that book, earbuds, event ticket, or reflect on what went wrong. School’s always in session. Celebrate the wins, big and small. It’s really easy to look at your never-ending To Do list and see what you haven’t accomplished. It’s also easy to celebrate the big wins because they are front-and-center and usually public. But it’s important that you celebrate the small wins as well. Did all your volunteers show up this week? Did that weird kid you adore finally make a friend? Did the next stage of the mission trip get planned? Did your team turn their budgets in on time? These are all reasons to celebrate. You may not throw a party for any of these reasons, but you should take a break, have coffee with a friend, or scroll leisurely through Instagram for a few minutes. You decide the reward, just be sure to enjoy it. Little tasks lead to large goals. They’ll also keep you motivated on the journey to progress. Can we just agree that there is enough shaming going on in the world? If someone heard you say some of the things to yourself that you think or utter out loud, you’d be declared a bully and sent home to get an earful from your parents. Enough is enough. Jesus was a big fan of grace, and guess what—that even extends to you. As a leader, you should absolutely push yourself to be better. But that doesn’t mean you should create additional pressure for yourself. That won’t help you lead better, but it will help you burn out faster. Become a person of grace, so that you can extend that same grace to others. Did any of these ideas surprise you? Probably not. Do you know why? Because you’re already a good leader. Sure, there are always improvements to be made, but just remind yourself how of far you’ve come. You care about the people you lead. You have some good days and some bad days. We all do, even those people who look perfect online. But right now, at this moment, you’re already a good leader. Bonus points for telling someone else today that they’re a good leader. It can be through a hand-written note, high-five, hug, or a few heartfelt words. It’s something we all need to hear, and is always appreciated, no matter what your title or experience. So, how can you be a better leader in this phase? Start by realizing you already are, and then make plans to build on that. Great leaders enjoy the process. And if you’d like to keep learning, celebrate big and small wins, and be kind to yourself all at the same time, we’d like to introduce you to Phase Guides. As the next chapter of The Phase Project, these interactive, journal-style books will serve as your guide while you lead and parent kids to grow in their faith and character. Because each of the approximately 936 weeks from when a child is born to when he or she graduates from high school will seem to fly by, we’ve created a guide for each year from newborn through 18 with research-driven information, engaging activities, spiritual reflection, and milestone celebrations. In each guide, you’ll discover . . . While we can’t guarantee that these guides have all the answers, we can guarantee that they’ll help you make the most of every phase in a child’s life. Because every leader can use an assistant.